If you&#8217;re among the many hobbyists and designers who came to electronics through Arduino and Raspberry Pi, this cookbook will help you learn and apply the basics of electrical engineering without the need for an EE degree. Through a series of practical recipes, you&#8217;ll learn how to solve specific problems while diving into as much or as little theory as you&#8217;re comfortable with. Author Simon Monk (Raspberry Pi Cookbook) breaks down this complex subject into several topics, from using the right transistor to building and testing projects and prototypes. 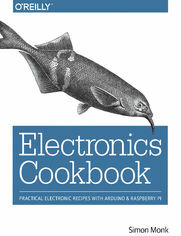 With this book, you can quickly search electronics topics and go straight to the recipe you need. It also serves as an ideal reference for experienced electronics makers.